Negativity is an insidious, contagious, and dangerous force. It makes us sick, sad, fearful, fills us with self doubt, stunts our growth, slows our progress, and prevents us from being the incredible, effortless, uniquely perfect beings we were each born to be. We all develop unconscious habits that empower negativity at some point in our lives. Often they start from childhood. What we were told by our parents, peers, teachers, magazines, and the lies we tell ourselves about ourselves, can stay with us for a lifetime. The problem with our thoughts is they’re not always true and we don’t always catch them. We don’t always see them slipping into our daily decisions, lying to us, or poisoning our spirit. How we feel is a direct result of how we think, but how we think can always supersede how we feel. Wellness begins and ends in the mind. If we are injured or sick, we cannot necessarily stop the pain without medical intervention. But by adjusting how we think about the pain, we can give ourselves the strength to overcome it. Positive thinking has been proven powerful enough to send cancer into remission. It not only improves our emotional state, but expedites physical healing. The difference between hope and despair could literally save a life. If you have ever wondered why you feel more depressed or anxious on any given day, start by examining your very first thought when you wake up. Often negativity starts as a whisper, and if we let it live, spirals into a roaring, lying monster that feels bigger than ourselves. But the beauty is, the darkness is never bigger than ourselves. Never. We always have the power to change our thoughts and perception. We are in control of our minds, not the other way around. It is an empowering truth. It’s not easy to monitor every single thought we have in a day. But we can always set the path right. Just like exercise boosts our metabolism and dopamine for hours after we’ve left the gym, the best way to avoid a negativity spiral is to exercise our minds with positivity. It might feel silly telling yourself you’re beautiful when you feel ugly. Or that you’re worthy when you feel useless. Or that you’re calm when you feel panicked. Or that you’re healthy when you’re ill. 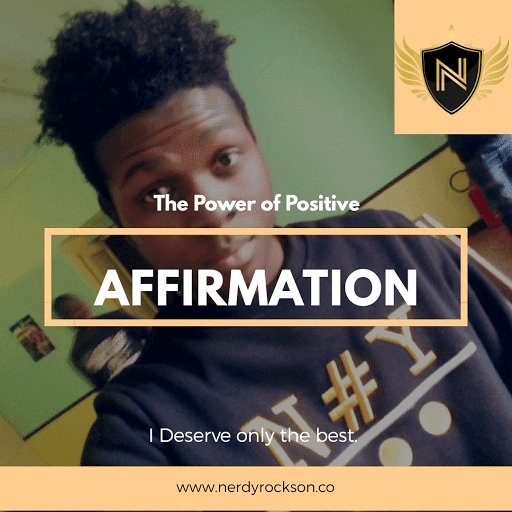 But it is imperative we tell ourselves these positive affirmations anyway. In therapy they call it “fake it ‘til you make it”. Have you ever tried to smile for no reason? Give it a go. Did you feel a lift in your heart? Do you feel better? We possess the ability to boost our own serotonin levels simply by raising our lips, even without an emotional prompt. This is because we have unconsciously been connecting smiling with joy for our entire lives. Reciting an affirmation is a similar principal. We train ourselves to feel through the repetitive act of doing. A positive affirmation is any positive, uplifting statement you state truthfully to yourself or about yourself. I prefer to recite my affirmations first thing in the morning, but they can be said any time throughout the day. I like to say them into a mirror, and I like to say them out loud. When I really feel myself doubting an affirmation, I say it twice. Here are some of my favorite PSA’s (positive self affirmations) that you can try for yourself. Incorporate them into your daily thoughts and speech and watch how your joy, serenity, energy, confidence, and productivity improve. You already possess all the tools you need to overcome any life circumstance. To turn them on you need only believe in yourself. If you’re not there yet, it’s ok, you will be. In the meantime, I believe in you. I am beautiful, exactly as I am. I am driven and will accomplish great things. I am purposeful. I was made with divine intention. I am a kind and thoughtful friend. I unapologetically establish my own boundaries. I love others without judgement. I am capable of overcoming whatever obstacles this day presents. I will not compare myself to others. I am enough. I deserve only the best. Today, I am overflowing with joy and energy. Creativity flows freely through me. My body is healthy. My mind is brilliant. My soul is peaceful. I am not afraid to stand up for myself. I forgive and peacefully detach from those who have harmed me. My past is not a reflection of my future. I am allowed to make mistakes. They only make me better. Today I will stop every negative thought in its tracks and replace it with a positive thought. Negative thoughts have no power over me. I stay present in every moment. I am funny. I make others laugh and love to laugh. I am made of love, grace, and grit. I believe in myself. I will succeed in any endeavor I pursue. I use my words and talents to change the world for good. I deserve to feed my body with healthy food. My contributions to the world make a difference. I am strong, and unafraid of my own power. I will not place my energy into my depression or anxiety. I am always evolving and I am ok with where I am right now. I am not ashamed of my body, or any part of myself. I surround myself with positive, loving people. I can avoid anything that doesn’t improve my life. I speak with confidence and self assurance. I am fun and fun loving. No one else has the power to take my joy. Everything is always okay. I choose to be at peace. I am alive, therefore I am capable of anything. I will seize this day. Thanks for the amazing article, I really learnt a lot from it.